Afghan crochet (also known as Tunisian crochet) has regained popularity recently. Many like the afghan crochet stitches because it combines the look of knitting and the ease of crochet. Upon the completion of a project, you have a solid fabric with excellent drape. Afghan crochet is similar to knitting as this method of crochet “carries” the stitches along as you progress across a row. You are essentially “picking up” stitches as you move forward and then you complete the stitch on the return row. As a result, crochet hooks for afghan crochet are much longer than standard hooks and have a stopper at the end, similar to a knitting needle. While using such a long hook may feel awkward at first, you will quickly adjust to the change and you will just love what you can create when using the afghan stitch! If you are comfortable with the single crochet stitch (sc), you will have no problem with the basic afghan stitch. The only “adjustment” you may have is using a longer hook. 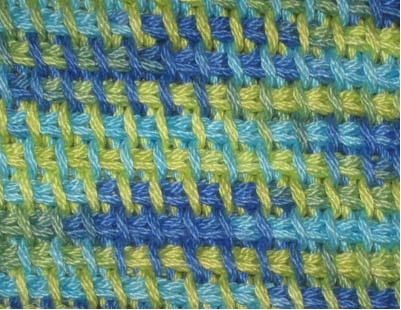 Complete a row of chain (ch) stitches, the same way any crochet pattern would start. To begin the “forward row” for the basic afghan stitch, insert hook into second ch from hook, yarn over (yo) and draw up a loop (just like the beginning of a sc). Instead of completing a sc, keep the loop on the hook, insert the hook into the next ch, yo and draw up a loop (you now have two loops on the hook). Continue to “pick up” loops until you have reached the end of the row. This completes the first half of the afghan crochet row. You should have the same number of loops as your starting chain. On the “return row,” do not turn your work, like you would when completing a standard crochet project. Working from left to right, yo and draw up one loop. Yarn over (yo) and pull through one loop. Yarn over (yo) and draw through two loops. Continue to yo and pull through two loops until only one remains on your crochet hook. That loops remains on your hook and counts as the first stitch of the next row. Insert your hook behind the next vertical bar in the row below. Do not work directly into the vertical bar directly below the loop on your hook. Continue to repeat in each vertical bar of the row below across until you have reached the next-to-last stitch. On the return row, yo and pull through one loop.